Parade Step Off from St. Daniel Catholic Church – 10:00 a.m. Air Force Flyover – 10:00 – 10:30 a.m. Hashtag #AFFlyover Businesses, organizations, individuals, famlies and friends are encouraged to participate in the parade as: Walking units, Driving an antique vehicle, Float, Political entry, Musical entry, Animal entry. Businesses and political entries have a $35 entry fee. Nonprofits, families, individuals and antique cars are free as long as they are not soliciting something. For more information, contact the Parade Committee at clarkstonparade@gmail.com or call 248 514 1729 Parade is approximately 75 minutes. Kids decorate your bike for the 4th of July and come ride in the parade. A bike “wrangler area” will be set up in the northwest area of St. Daniel Catholic Church parking lot. Kids and bikes do not have to preregister but be in the parking lot by 9:00 a.m. the morning of the parade. Remember parents, no parking on the St. Daniel Catholic Church parking lot. The Clarkston Fourth of July Parade will assemble on the grounds of St. Daniel Catholic Church. Large vehicles, if assigned by the committee, will lineup on Valley Park Drive. All other entries will be in the parking lot at their assigned times. All vehicles for an entry should entry the parking lot at the same time. There is no parking on the St. Daniel Catholic Church parking lot. Parents may use the drive through to let students out, but no prolonged stopping at St. Daniel Catholic Church. 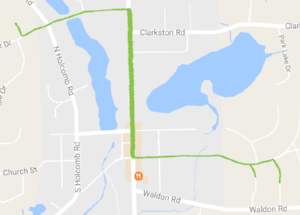 The Clarkston Fourth of July Parade will leave the parking lot sharply at 10:00 a.m. with a left turn onto Valley Park Drive, crossing over Holcomb Rd. to Miller Rd. Parade entries will continue down Miller Rd. and make a right turn on Main Street. The American Legion Color Guard will lead the parade as they have done for over 70 years. All candy or items must be gently tossed to participants. There will be a parade station at 90 North Main Street where each entry will be announced as time allows. The parade will stop at 90 North Main Street for a 21 gun salute by the American Legion Post #63 and the singing of the national anthem by a student from Clarkston High School. After the ceremony, the parade will continue down Main Street, stopping near Rudy’s Market for the same ceremony. The parade will then continue down Main Street making a left turn onto Church Street. Parade entries march along Church Street until they come to Renaissance High School. Smaller entries, no vehicles can exit the parade route through the gate. Vehicles need to continue on Church Street to Cherrylawn Street, make a right turn on Cherrylawn Street and maybriefly disassemble in the parking lot of Renaissance High School. Please honor the “briefly disassemble as other floats are following. Porta potties are located at St. Daniel Catholic Church, 90 North Main Street, Village parking lot and Renaissance High School. If entries need to return to the St. Daniel Catholic Church area, they can exit Renaissance Center with a right onto Waldon Rd, left on Main Street, right on Dixie for 3 miles, left on Deerhill Drive, left on Dark Lake Drive to Holcomb Road and back to St. Daniel Catholic Church area.